Please Call to secure reservation. Looking for a unique present For your Die Hard Fisher? Howie is one of our Die Hard Fans and this is just one of his Awesome catches out on the water with us. Mahalo Howie for your support!!!! Look How Happy Captain Fuzzy is? We would like you to be happy too. 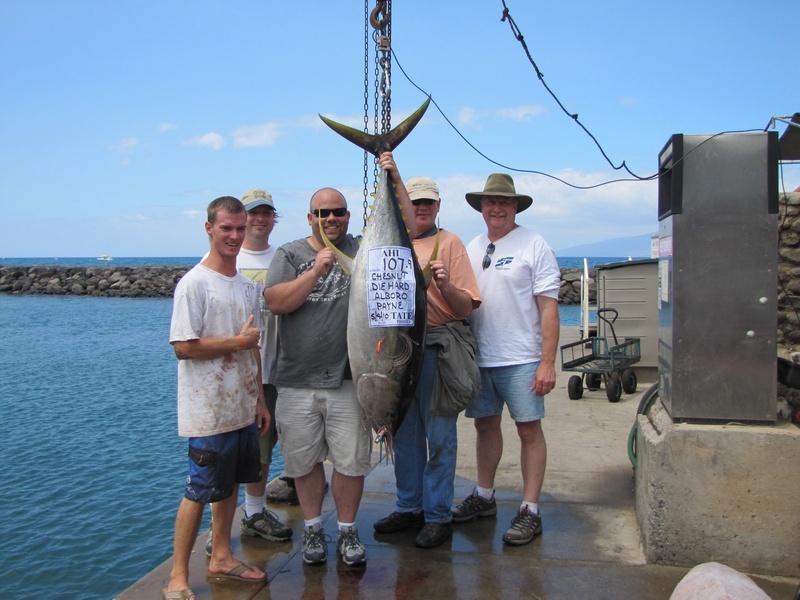 That is why we have the earliest departures and are one of the top producers in Maui for sport fishing. Hope to see you on your trip in Maui. Below are some of the best catches we have had in 2018, not all our catches but some of the best. We do normally catch 90% of the time. We hope to make your trip to Maui a DIE HARD experience. Only one week away from the end of 2017 and Here at Die Hard we can only say how blessed we are to be so fortunate to Live, Work, and Play in one of the most beautiful locations in the World. Thank you to all of our charter guests that came aboard the Die Hard in 2017 and we look forward to 2018. 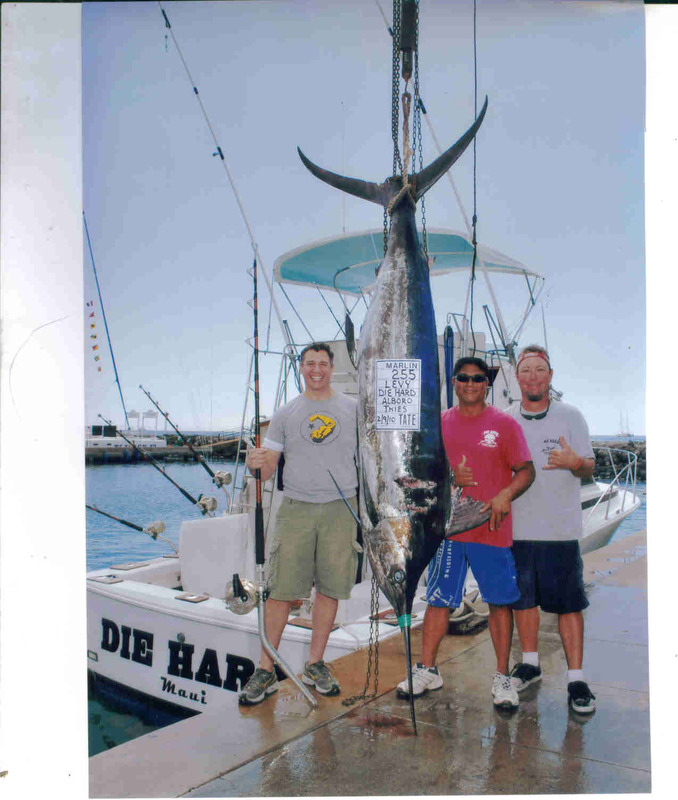 What a great day on Maui aboard the Die Hard with Capt Fuzzy and Sam. It is very rare that we do not see this type of catch with Capt Fuzzy. He leaves the earliest, uses live bait and gets to prime fishing ground at the time when the fish are the most hungry. When it comes to fishing Captain Fuzzy isn't just taking a boat ride. 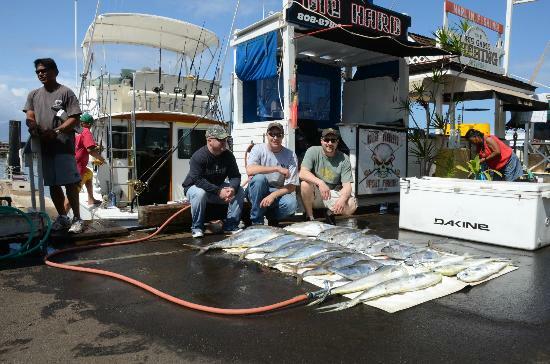 Book your fishing trip aboard the Die Hard on your next trip to Maui. Bachelorette Party! Look at these beauties! The girls look good too! First catch of the Year! Hau'oli Makahiki Hou! Video of a typical fishing trip aboard the DieHard. Mahalo Mark for being a DieHard Fan! After a life time of fishing. Mark one of our returning customers has caught the ONE! Mark has been wanting to catch a short billed Spearfish the Rarest billfish in the world for over 30 years. Mahalo again for being a DieHard fan! WE ARE BACK!! Let's Go Fishing! My husband and I went out on Fuzzy and Sam's inaugural charter in their new slip and had a great time! I went really just to watch and experience the deep sea fishing culture. I was a bit leery about leaving at 11pm and going all night but turns out these guys know what they're doing! They said that's when the fish were biting and they were. They caught bait fish on the way out to the buoy which was fun. When we got closer to the buoy Sam woke us up and gave us a quick lesson as to how to handle the rods and what not. Then the fishing began. They baited the rods and got them started. Once a fish bit on, my husband took over and reeled them in. 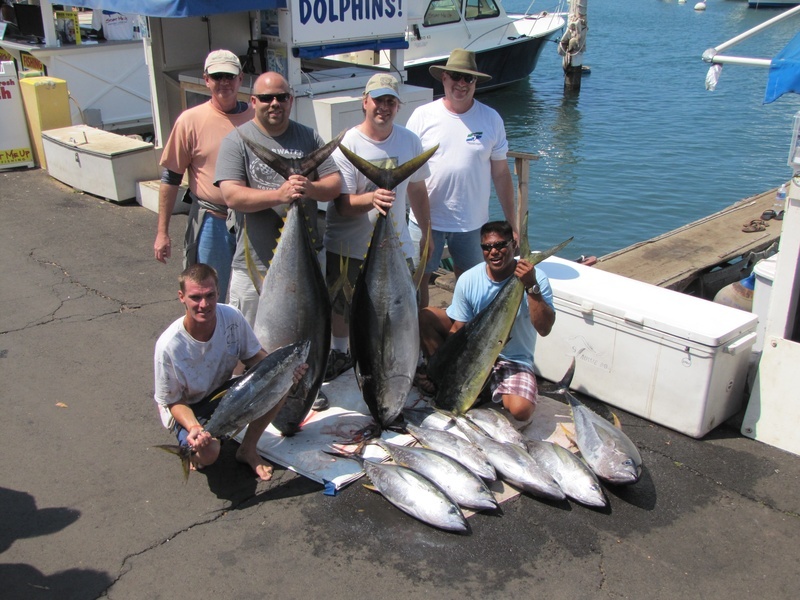 We caught 6 fairly large yellowfin tunas and 2 smaller tunas. Even with only 1 fisherman, they still managed to get all these fish. 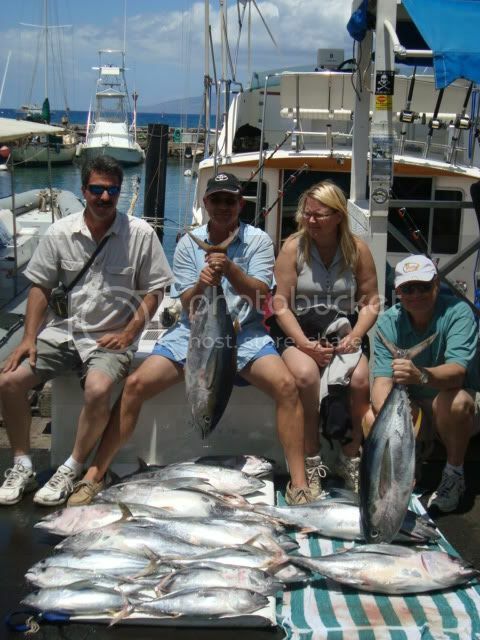 Fuzzy and Sam are very passionate about sport fishing and very knowledgeable. They both helped Jason learn the techniques needed to get the fish in. I was also impressed with how well the managed the boat. They were both constantly doing something, when fuzzy was driving, Sam was getting gear ready and cleaning the boat. If Fuzzy needed to cut the fish or do something else Sam managed the wheel. They worked effortlessly and fluidly as a team with great communication. Would recommend this to anyone who is looking to fish in Maui and we WILL be back! We Want to thank Our Customer Westbru's Channel on You Tube for this Great Video! 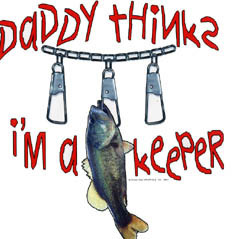 Please send Us any Videos you might have when you fished with Us. We spent days researching countless boats and trying to decide who to go with. There were 12 of us so we needed 2 boats. We decided upon Die Hard and another boat I can't comment on as much as I wasn't on it. We booked our 8 hour charter. We got a call the day before confirming our time of 1am departure and sure enough Fuzzy and his 1st mate were there ready to go. They had done their live bait bait fishing and had only come up with 6 fish(they started losing enough fish/lures to sharks they gave up). Needless to say we were a little worried on our chances. We spent our first 5 hours cruising in pitch black to our fishing hole. (also left us a bit worried how much actual fishing time we were going to get.) Fuzzy and Sam assured us we needed our rods in first light as thats when the tuna would feed. Once we hit the spot, we got an overview how this was going to work and started setting the rods. Got our first line in the water and we hadn't even set the second before fuzzy had a tuna on and we were away fishing! Our first 20 mins and we had 5 tuna in the boat. Hour later and we were up to 12. We had yellowfin, big eye, skipjack. All in we land 18 tuna(all around 15-30lb) in the boat and a couple lost. Multiple times we had 3 fish on all at once. After tuna fishing for awhile it was time to set the lines and go for the big ones! We set the lines and began fishing as we trolled our long journey back towards the harbour. Line started flying! After a long battle we landed ourselves a 328lb and almost 11ft long marlin in the boat. We had one other bite on our way back which appeared to be an ono but we lost it. we reached the dock back at 11:30 which in total left us with a 10.5 hour day on the boat at no extra charge. There were 8 boats on the radio which came back empty and our other group; that went on another boat came back with minimal fish and of small size. We told fuzzy we were in town for a wedding and wanted to bring back some fish for a big barbecue. Unlike some other boats we had read about these guys are generous with their fish! 4 ziploc bags stuffed with tuna they could barely close. We fed the whole wedding of 40 for 2 days at bbqs with tuna steaks, home made poke and sashimi. I have fished many times and these guys tried so damn hard even after our arms started to pack in due to fighting fish. I would recommend them again in a second and we have already talked about heading back to maui again, even if it is just to fish. Fishing with Die Hard is the Best! NEW BOAT DIE HARD 2.. 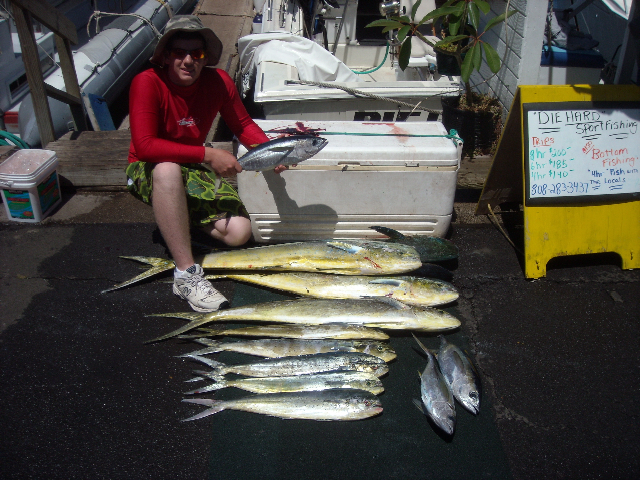 I chartered Die Hard on 5/9/13 since I went on it last February with my 14 year old son and we caught 22 yellow fins and had a great time. We had 5 on the boat and were with Sam and David. Both of them did a great job as David was at the wheel and Sam took care of us. Can't say enough for how cool they were and talked to us, were just laid back and let us know they cared about us and their job. My 15 year old Richie had a great time with both of them and thought they were the best he's been with. 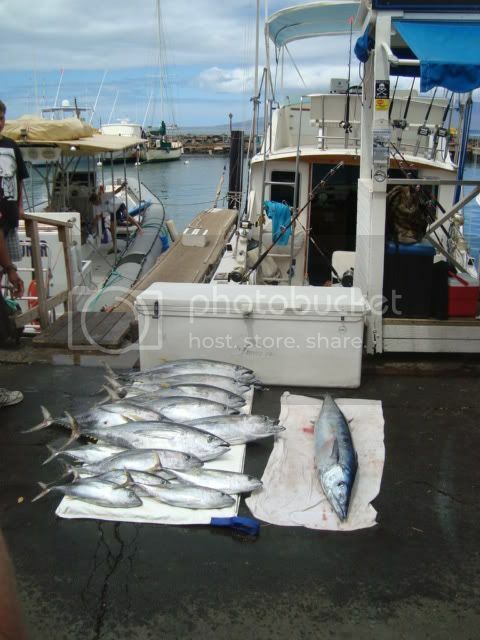 We baitfished for around 45 minutes and once we had enough mackerals, then we head out for 3.5 hours to fishing grounds. Within 10 minutes my 13 and 15 year old sons each had 20lb tunas. Once those were landed, then my father in law got a 17lb mahi mahi and then I landed a 40lb mahi mahi that was awesome. My brother in law had a mahi on right after me but he did not know what he was doing and did not listen to what Sam told all of us earlier and lost it (not the crew's fault). We then switched to some jigs and caught 8 skipjacks, 2 more yellow fins and then a blue runner that was really cool. I know not everyday can be guarranteed but I have been on Die Hard now 2x and both trips were awesome. Garrett took care of us getting the boat set up and Sam and David were top notch running the boat. If you want a real day of fishing starting late at night, hit Die Hard since it's an experience you won't forgot. Thanks again to Sam and David for working their hinds off for us. NEW PIC"S thank you Jared!!!!!! SWEET!! Thank you Jody, We are Glad you had a Good time Fishing with US! 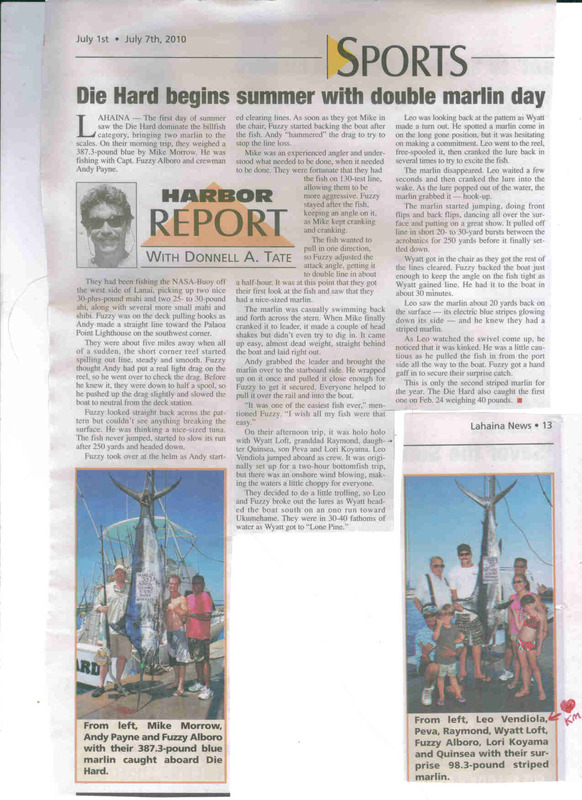 DIE HARD Sport Fishing recorded over 300 Yellow Fin Tuna a month this last summer!!! WELCOME ABOARD to all NEW MEMBERS!!!! 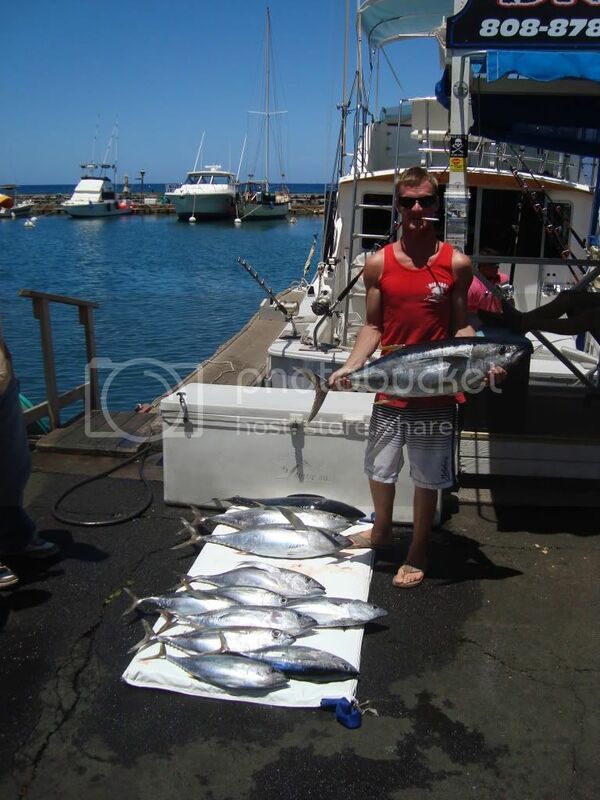 To Get $5 Off per person Call direct 808-344-5051 LET'S GO FISHING >> CALL TO BOOK NOW WE ARE FILLING UP FAST! Please Welcome Mike to Our Member area this is his coment "
"I went out with Fuzzy and Turtle on Feb 19 of this year had the time of my life. We caught mahi mahi and tuna. Turtle I will be back soon so we can get a rematch with that 100 plus pound yellow fin that got off at the boat. see you soon"
***PLEASE CHECK OUT THEIR PICTURES IN THE MEMBERS AREA!!!!! You Can GO>>>>>>> To The Members Area click Register fill in the little form and then you can Upload Pic's Try It It's Cool !!
" I caught a 39 pound yellowfin tuna, my biggest fish ever. I fished with Fuzzy and Andy in 2009 and caught lots of fish and I caught the 39 pounder in May 2011. Fuzzy wants to catch fish as much as any one. He really gets pumped up. When I had this fish on, he yelled, "Reel faster, reel faster, Tom. It's a bigger fish; it's a bigger fish." When we got back to the dock, I was all excited taking pictures and showing off my fish to anyone who passed by. Fuzzy came up to me and said he was sorry for yelling at me. I told him there was no need to apologize and I gave him a big hug. I will fish with Fuzzy and Andy again as soon as I can. I'm not a good fisherman. 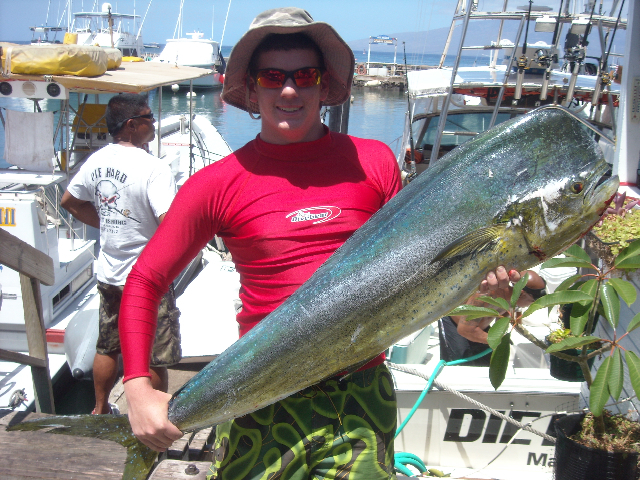 I'm a tourist, and Fuzzy takes good care of Hawaiian tourists at Die Hard Sport Fishing." Now thats what I am talking about! What a GOOD looking guy!!!!!! now where is the fish pic's? 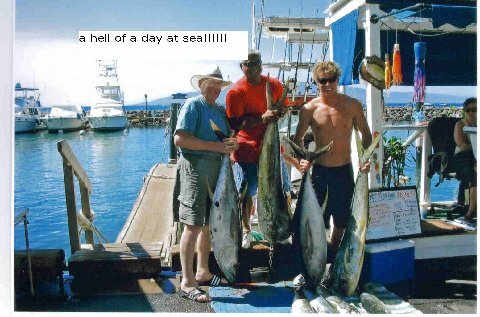 Scott is fishing with Fuzzy tomorrow,,,,,, he is one very,very,very lucky fisherman..... Pic below 2008...ooooppps ! I think he was fishing with Fuzzy dad ???? hummmm? :) NEW PIC'S tommorrow! GOT PIC Way To Go Darin!!! Nice Fish!!! WOW it is Raining like ..a lot! 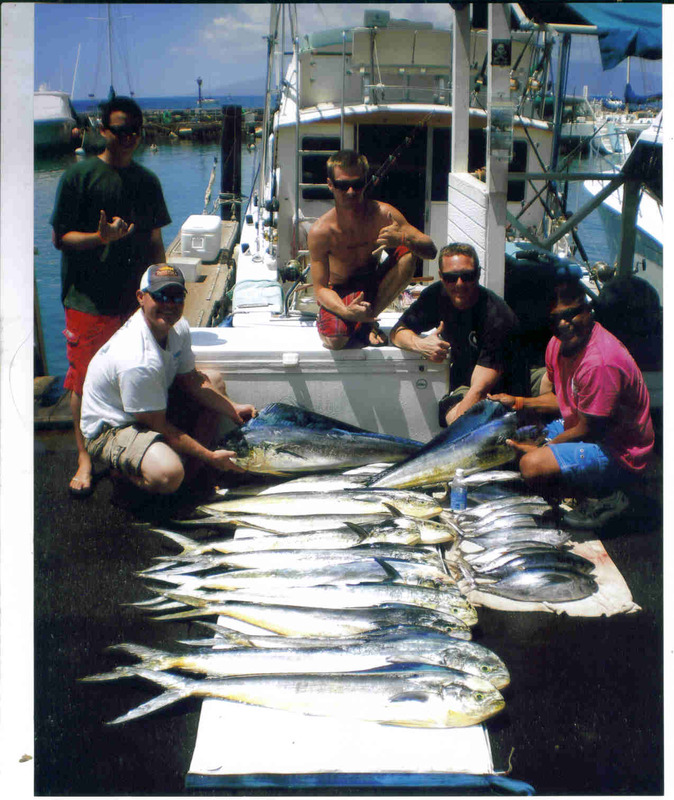 NEW / OLD Pic thank you for the pic Aloha..... the Bauer's fishing with Capt Fuzzy on Iwalle in 2002 Catch... 2 Striper Marlin..Whooooo!!! DIE HARD comes in 1st place AGAIN!!!!! 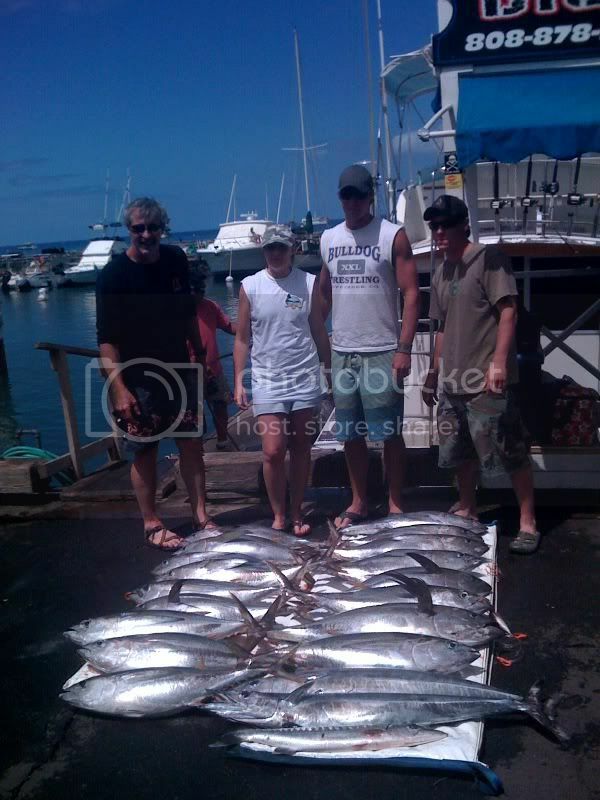 with more Marlin in 2010 out of 27 boats in Lahaina Harbor!! Whoooooo!!!! 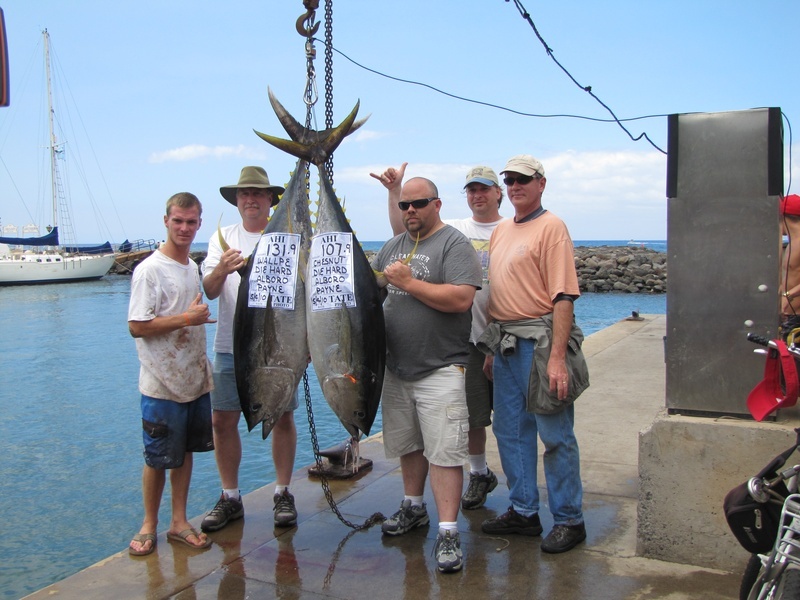 Tim and Fuzzy with 46 lb Ono.... Tim is Fuzzy helping you you hold that big fellow???????? Thank you Tim for this great photo of Capt Fuzzy I love it!!! he proably wont, he is such a humble guy. GREAT PIC!!! he can catch FISH!!!! !